These three dishes have almost the same ingredients but they differ in the meat used. Originally, Afritada is cooked with chicken while Caldereta (Kaldereta) is cooked using beef or goat, and Menudo is cooked with pork. 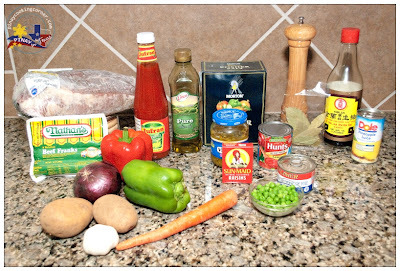 In all three dishes, meat is stewed in tomato sauce with vegetables like carrots, potatoes and bell pepper. I tell you, they are all so good. I guess that is why all of them have evolved into many variations which differ from region to region and even from family to family. Some use beef, chicken and pork interchangeably in these dishes. I remember that when I was little, I would often get confused with what dish I am eating whenever we're attending fiestas, weddings or other parties. 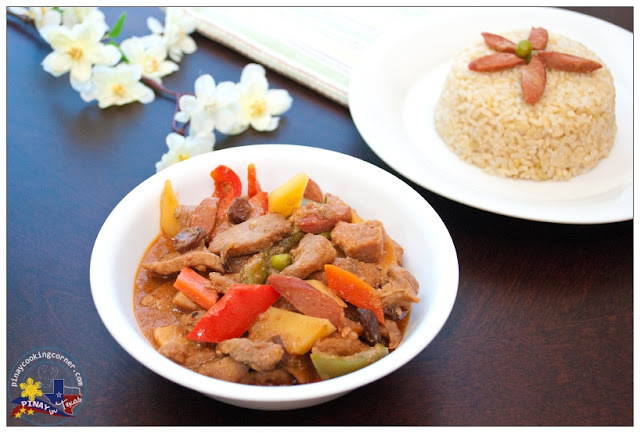 When I see a tomato-based pork stew, I would often ask my mom/dad if it's afritada, caldereta or menudo. My parents said it would be simple to distinguish the three dishes from each other if the the person who cooked the dish sliced the meat properly. My dad said that meat in Afritada and Caldereta is supposed to be cubed, about 1"x1" for Afritada and about 1.5"x1.5" for Caldereta..and for Menudo, meat should be cut into thin slices about 0.75"x2" in size. My parents said that the way the meat is sliced will help differentiate the three dishes from each other even if the same meat is used...and I totally agree with them. I know that many cooks slice the meat differently, but from where I grew up, that's how it is...cube for afritada and caldereta and thin strips for menudo. 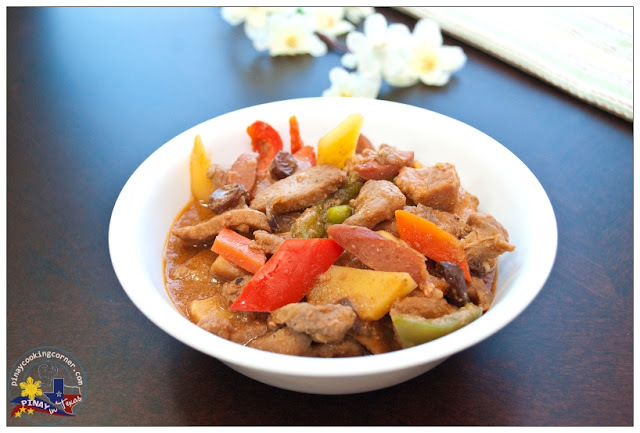 Unlike the famous Mexican Menudo which is made of tripe in red chili base, the Filipino Menudo is made of pork (marinated in soy sauce and calamansi) and calf liver, cooked in tomato sauce with vegetables like carrots, potatoes, bell pepper, green peas or chickpeas, as well as raisins and Filipino red hotdogs. My daughters don't like liver too much so I omitted the liver strips in this recipe, and just used canned liver pâté for thicker sauce and the needed liver flavor. For the red hotdogs, I used beef franks as substitute, and instead of using kalamansi or lemon for marinade, I used canned pineapple juice. This gives the meat a slightly sweet flavor that my daughters really love. 1. Cut the meat in thin strips about 0.75"x2" in size. Combine marinade ingredients in a bowl and marinate the meat for at least an hour (for best result do it overnight). 2. Saute garlic in olive oil until light brown. Add onions and saute until translucent. Add the meat, stir and cover the pan. 3. Stir occasionally, and keep the lid on until most of the liquid comes out of the meat. Add the raisins, pickle relish, tomato sauce and banana catsup. Season with salt & pepper and bring to a boil. 4. Add the liver spread and stir. Cover and simmer over medium heat until meat is close to being tender, about 10-15 minutes. Add the potato and beef franks. 5. 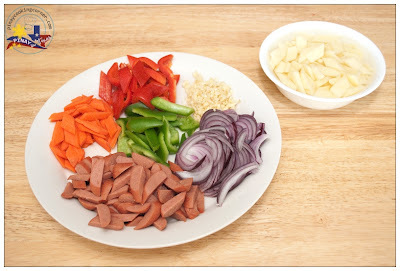 When the potato is halfway to being cooked, add the carrots, green peas and bell pepper. Simmer for 5 minutes more. 6. Remove from heat. Serve hot with rice. Oh yum ! Haven't eaten menudo for quiet sometime ! :P Scrumptious dish , Tina ! I love stew all the way and a small bowl with the must have, rice. Lovely and I will try out your version because I am running out of ideas on what type of stew I should make this Saturday. 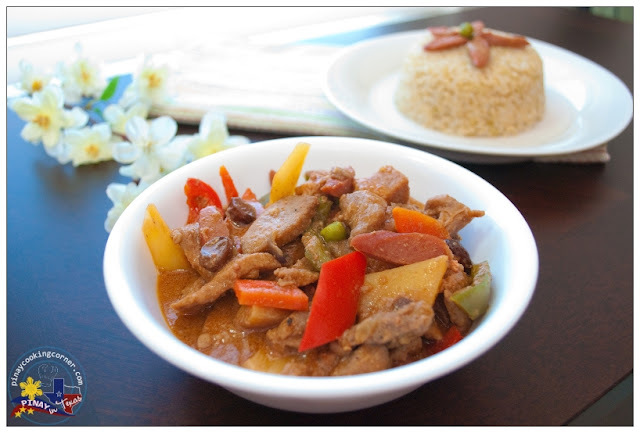 Asian stew always good with hot rice that what I like it too :) Thanks for step by step preparation to share this great stew recipe,as always ! This sounds wonderful and you've got all my favorite ingredients into one dish. Look so colorful with the veggies. This is such a beautiful and comfort dish. You are right I love stew too and this local dish looks very delectable! Great pics and recipe you have here! I like it! recipe is perfect good call on the liver pate my husband doesn't like the liver added to it either!. Hi, thank you very much for the information about the differences of minudo, afritada and kaldereta.... Im a Filipino, and I too can't tell which is which but I had noticed it too the different style of cutting the meat, i just didnt know theres a reason for that... And now I know and it's all thanks to you.